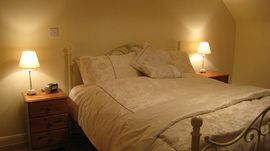 The cottage has two bedrooms, a twin bedroom downstairs with television and DVD and a bathroom with bath and shower. 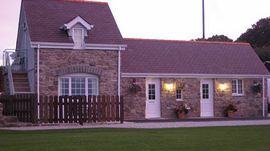 There is a king sized bedroom upstairs, with a spacious shower room and small balcony overlooking Moelfre Bay, where visitors can see the Lifeboat being launched. 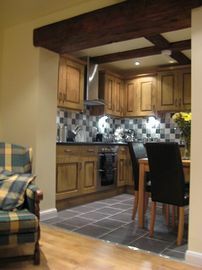 It has a traditional open beamed kitchen-lounge area with built in dishwasher and fridge. 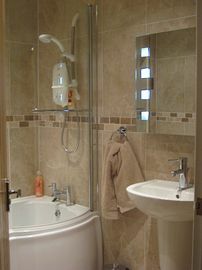 There is also a utility room with freezer, washing machine and dryer. 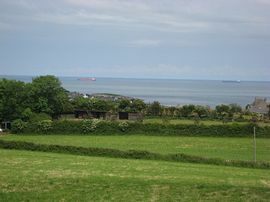 The cottage has an acre of garden with magnificent sea, mountain and countryside views. The local beach is 5 minute walk away and coastal paths run adjacent to the property. Peaceful location with magnificent views. Guests are asked to smoke outside the property and discarded their cigarette butts in the ash trays provided. Local Services: Local bus stop 5 minutes walk away. From the mainland take the A55 expressway then take the exit A5025 signposted Amlwch over the Britannia Bridge. Carry on the A5025 through Benllech and then you come to the the Moelfre roundabout with an Anchor on it. Then we are situated on the 2nd exit off the roundabout signposted Ancient monuments. Go down the lane and we are the 2nd property on the right. On the roundabout I have a brown sign with Bryn Awelon B & B and an arrow pointing down. On the train you get off at Bangor Station and take the No. 62 bus to Moelfre.